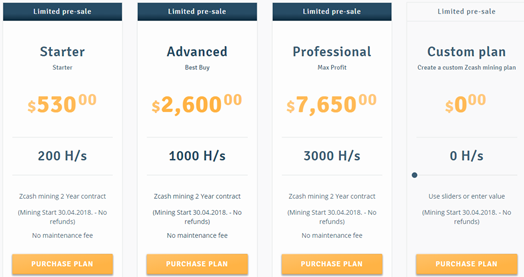 If you are interested in Zcash cloud mining investment attractiveness, then you came to the right place. In this review, we go over industry specifics of Zcash in terms of mining difficulty, algorithm, supply, and future prospects. 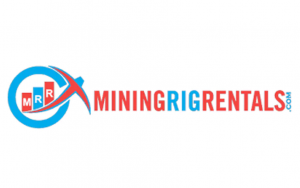 Cloud mining is a market that orients towards long-term commitment. Thus, it is important to understand the past and present in order to deduce future of the coin. Hashflare and Genesis Mining are two providers of Zcash cloud mining contracts. Stay tuned as we go over the Zcash’s profitability indicators, such as available contracts, fees, and platforms. We also benchmark the cryptocurrency with other coins as well, such as Bitcoin, Ethereum, DASH, Litecoin, and Monero. The cryptocurrency established itself as one of the leading coins in the industry, right behind bitcoin, Ethereum, and Litecoin in terms of value and network. 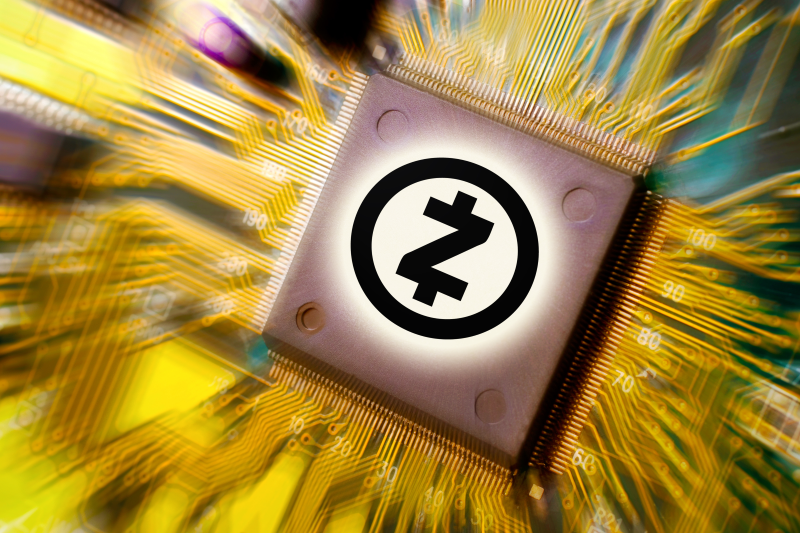 Zcash was established by the Zerocoin Electric Coin Company, led by a founder Zooko Wilcox-O’Hearn. The development team that worked behind the curtains created the currency in 2016. Since its beginning, the blockchain security and privacy are secured through zk-snarks. 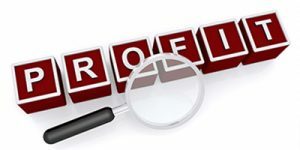 The said function allows users to hide personal details regarding their transactions in blockchain’s records. As for the mining algorithm, crypto uses Equihash as a hashing algorithm, a proof of work (PoW) developed by Alex Biryukov and Dmitry Khovratovich. Through Eqyuihash, mining difficulty did grow in the following year, especially in 2017 but the line was not as sharp as other coins. The picture below represents the trend, with the largest growth record in March 2018. It is expected for the trend to rise but not as much as with bitcoin and Ethereum for example. The fixed total supply of 21 million coins definitely helps in keeping value and volume inflation rates in check. Thus, cloud mining calculations and planning are much easier to do with Zcash than with other coins. In terms of its price, Zcash, like so many other cryptocurrencies, closely follows bitcoin. The growth of bitcoin also affected Zcash, growing when BTC grew and falling in recent month as well. The chart below shows exactly such trend, where at the end of 2017 price went up and then fell in March 2018. This is quite important development since you are betting on the fact that Zcash might grow in value in the future. If bitcoin’s price falls down, then you can be sure it will affect Zcash as well. You must plan your payouts according to the bitcoin’s market trends and developments in order to get the best price. 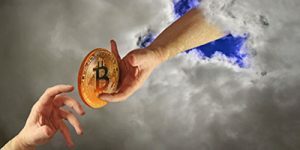 For a market worth of $1.3 billion, BTC is quite an important to measure when cloud mining profitability is in question. When designing cloud mining calculator, you have to take into account present indicators and their possible routes in future. Most of the cloud mining deals are lengthy, meaning that you are stuck with what you get right now. Zcash, in this essence, performs better than bitcoin, Ethereum, and even DASH, as it has somewhat stable growth of difficulty. Although greatly increased within a year, we can expect for growth to remain relatively stable for next year. As for the price, this is where waters become more murky, as coin depends heavily on bitcoin’s trends. The fact that BTC can influence Zcash means that you should include BTC’s growth/fall rates as well in your calculations. Since equipment used is similar to those of Litecoin and bitcoin, except for contracts either to have a high price or to include maintenance fees. Electricity bills for mining Zcash can be hefty, as it uses similar PoW algorithm as those cryptos as well. We do expect for the coin to increase in value due to the tightly controlled volume. But you should also seek out competitive cloud mining programs before you invest. Zcash contracts follow the same route as other cryptocurrencies when cloud mining contracting is in question. The usual length of the contract for Zcash ranges from a year to two years, depending on the provider. Thus, the difficulty and price fluctuations are immensely important when determining the profitability of the chosen plan. As for the maintenance fees, cloud mining deals for Zcash tends to be either more expensive to purchase than others. The equipment used to mine cons uses up a lot of electrical energy, meaning additional costs to you. In other words, you either pay separate maintenance fees or expect to pay a little bit higher value at the start of the plan. In this section, we go over two popular choices for Zcash cloud mining. The platforms that offer the service are Genesis Mining and Hashflare. These companies are investigated in terms of contract length, maintenance costs, and plans’ pricing. 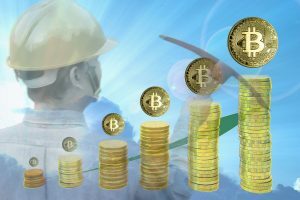 When it comes to cryptocurrency cloud mining, genesis Mining is probably one of the first names you will hear. The company established itself as one of the top players in crypto cloud mining and has been operating since 2013. Their mining operations in Iceland offer the needed supply for coins in their portfolio, Zcash included. At this moment, there are three programs to choose from, them being Starter, Advanced, and Professional. You can check out the details below. The contract is set to last for 2 years and there are no maintenance fees. However, the cost of these plans is topped only by Ethereum, meaning that all mining expenses have been incorporated into the plan value. Hashflare offers a different program, as you get to choose the amount of hash power you need for Zcash cloud mining. For every 1 H/s, you need to pay $2.00 for a contract that lasts a year. The maintenance fees are not charged while plan itself is relatively cheap. 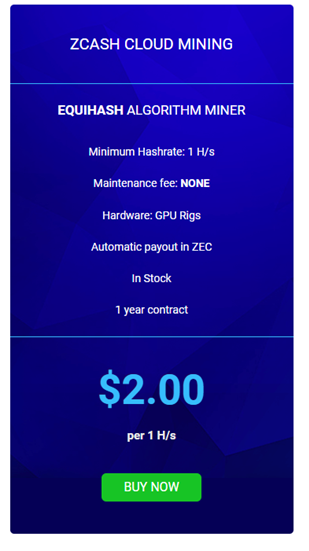 Even when compared to others, Zcash cloud mining at Hashflare proposes one of the best deals in the market right now. That is if payouts turn to be as good as Hashflare’s pricing policy. You can check out details of the plan in the snapshot below. In this Zcash cloud mining review, we went over cryptocurrency’s ability to turn cloud mining investment into profit. Zcash is the best choice at this moment due to its stable difficulty growth and competitive pricing of contracts. The payouts might go lower in the near future but its value is expected to follow BTC or, in other words, to grow.